A collection of environmental portraits of various people made for editorial, corporate and advertising clients. Studio and environmental portraits made for editorial, corporate and advertising clients. Portraits of born-again evangelical leader David Lane. Portraits of Winnebago Industries' CEO Randy Potts at the company's production plant in Forest City, Iowa, on Thursday, August 07, 2014. Karl Ulrich and Christian Terwiesch are both professors at The Wharton School at the University of Pennsylvania and co-authored the book "Innovation Tournaments: Creating and Selecting Exceptional Opportunities". 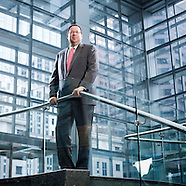 Portraits of Trunk Club CEO Brian Spaly, taken in Chicago. Hai-Ye Ni is the principal cellist for the Philadelphia Orchestra. Philadelphia restauranteur and chef Marc Vetri owns the restaurants Vetri and Osteria. Philadelphia Daily News sports columnist Bill Conlin was pictured in the press booth of Citizens Bank Park in 2009. Congressman Joe Sestak is running against Senator Arlen Specter in the Pennsylvania primary election this spring. Violinist David Kim is the concertmaster for the Philadelphia Orchestra. He was pictured on October 22, 2009 in Philadelphia. 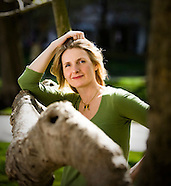 Elizabeth Gilbert is the author of the book Eat, Love and Pray.